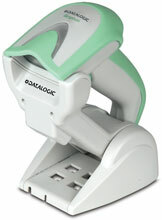 The Datalogic Gryphon I GBT4100-HC healthcare reader with disinfectant-ready housing features a batch mode capability allows more than 1200 barcodes to be stored in the memory. Combined with a 33,000 scans per charge Lithium-Ion battery, these two features create unlimited mobility and reliable data collection when out-of-range. Datalogic's exclusive patented 'Green Spot' for good-read feedback helps to improve productivity in noisy environments or in situations where silence is required. When using the Gryphon I GBT4100-HC with the cradle at a 45 degree position, the Green Spot can work as an aiming system to aid in positioning the bar code for quick and intuitive reading. Standard multi-interface capabilities include USB, RS-232, Keyboard Wedge and Wand Emulation for the GBT4130 models. IBM interface models include IBM 46XX, USB and RS-232 Emulation for the GBT4110 models. The Datalogic Aladdin configurator provides user-friendly features that simplify the start-up procedure. GBT4100-HC	 Gryphon I GBT4100-HC, SCANNER ONLY, Disinfectant-ready Health care Housing, Linear Imager. Color: White. Interface cable, base station, and power supply sold separately. The Datalogic GBT4100-HC is also known as Data Logic	DTL-GBT4100-HC	or GBT4100HC	.